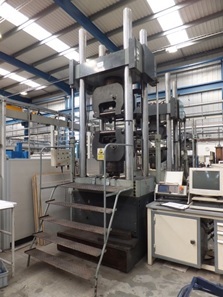 Various test machines (Amsler Vibrophore, ESH, Instron, Losenhausen, Mayes) that can operate under a range of conditions to perform uniaxial fatigue testing. A range of actuation methods including servo-hydraulics, hydraulic pulsator and electromagnetic. Although the theoretical maximum frequency that can be achieved is 20Hz the maximum depends upon the stiffness of the material being tested - higher stiffness, higher achieveable frequency.